There is a current need to increase global livestock production in line with consumers’ preferences for more sustainable and ‘natural’ products. Organic farming is considered among the potential production systems and market strategies that could be employed to cope with this change. Animal nutrition is key, as it greatly influences feed efficiency, animal health, and sustainability. Under situations where animal health care is technically more challenging, due to limitations in the use of veterinary drugs (such as in organic farming), the importance of feed is even higher. However, there is a lack of commercially available permitted feed ingredients and the range of feed additives on the market is limited. This is partially due to the fact that organic regulations are mainly followed to ensure that pure organic methods are used, instead of trying to attain the core goal of complying with organic principles and contributing to the sustainability of the sector. For example, improved animal health and animal welfare through the use of non-organically certified feed additives but proven to positively contribute to sustainability (e.g. through Life Cycle Analysis) is needed. This lack of availability, along with difficulties for the feed industry to become organic, affects the development of sustainability in the livestock sector (which should be the final objective of organic farming) in both already organic livestock/feed companies and those still producing under the conventional system. In this context, the presented work may be interesting to producers and policymakers, as it is aimed at providing a critical view of the relationship between the market and the needs of the livestock sector, the sustainability challenge, and organic farming regulations as applied to animal nutrition. Keywords: animal production; animal nutrition; ruminants; cattle; cow; beef; poultry; swine; sustainable intensification; food security. In Figure 1 a graphical abstract is provided in order to facilitate the understanding of the article and its storyline. The livestock sector is and will be in the spotlight, as it must satisfy the growing global demand for animal protein  while complying with sustainable production principles (animal welfare, equity, food safety, healthiness, and environmental protection) . Such compliance will not be easy to achieve, as it requires agricultural production to increase by 60%  compared to 2005/2007 production levels. Livestock production requires large amounts of resources (feed, land, water), which are also limited. It is therefore necessary to increase the sustainability and efficiency of the livestock sector, and the feed industry has a significant role to play . Meat consumption is projected to rise nearly 73% by 2050, and dairy consumption by 58% from current levels. Estimates show that between 2010 and 2050, animal protein production is expected to grow by around 1.7% per year, with meat production rising by nearly 58%, aquaculture by 90%, and dairy by 55% . This should be good news for the feed industry. However, such growth comes with significant challenges and it is vital that the sector meets these demands in a sustainable, safe, and affordable manner, while maintaining consumer trust and confidence in the food supply chain. In meeting these future demands, sustainability and animal welfare are not optional, as reflected by many consumers’ concerns and wishes . Animal products now must be compatible with strict consumer demands, such as animal health, absence of veterinary drugs (residues), sustainability, animal welfare, convenience, and food safety. This partly results from episodes in food industry, such as BSE (“mad cow disease”), food waste, and groundwater pollution. The production system under which animals are reared (including how they have been fed) is one of the aspects for which consumers have higher demands. This is because meat consumption presents some consumers with a moral dilemma regarding the other sentient beings, that is, livestock . Due to this, many food companies are adding sustainability in their CSR (Corporate Social Responsibility) policies . The feed industry thus faces a challenge, but also a great opportunity, to improve the sustainability of their production chain. The livestock industry is an important contributor to global greenhouse gas (GHG) emissions, a large part of which results from animal nutrition. Among other reasons, this is due to an increased global population and demand for animal protein, leading to a continuous growth in volume and value [4–6]. The International Feed Industry Federation has observed a growth of production, particularly in the developing world, while production in the developed world remains more or less stable. Global commercial feed manufacturing generates an estimated annual turnover of over US $370 billion. Due to this, animal nutrition is an important pillar, as it has clear potential to significantly increase the sustainability of animal production [2,6–8]. Over the past 30 years, feed conversion rates have, on average, been reduced by 30%, reaching approximately a level of 1.2 for farmed fish feed, 1.8 for poultry feed, and 2.5 for pig feed . This is the result of different research studies carried out mainly over the last two decades with the aim of reducing the environmental impact of livestock production systems through feed management. Methods have included, for example, analyzing the influence of different diets and active compounds. Organic farming has been studied by various authors in order to assess its potential impact on environmental and socio-economic factors (sustainable rural development) [9–12], with reference to its current and future growth. Industry analysts forecast that the demand in many markets will continue to grow at a rate of 10–30% per year, with the international organic market expected to grow to a volume of US$ 100 billion in the next decade . However, it is not possible to generalize about the consequences of organic farms and methods due to the diversity of the production systems that exist under the organic umbrella. Agricultural management practices are only optimal if they are site-specific and dynamic , so production systems must be suitable for local conditions (whether they are organic or not). A limitation to sustainability in animal livestock is the lack of availability of organic feedstuffs on the market, which is partially due to difficulties that the feed industry faces in complying with organic regulations. Animal nutrition must, therefore, be at the core of the One Health Approach (animal health, ecosystem health, and human health), which is in line with sustainability dimensions and organic principles . The latest amendments of the EU regulations for organic livestock farming [16,17] increased the limitations on animal feed sources by reducing the percentage of conventional feed allowed to zero. At the same time, the organic sector has grown during the last few years (and it is predicted that it will continue to do so), and there are ‘intensive’ farms—not pasture-based, as organic farming regulations allow for a great diversity of production systems. As a consequence, a large number of livestock farmers face a lack of organic feed supplements . From the economic dimension of sustainability, this is a negative, because if the supplies of organic feed do not keep pace with the increased demand, shortages of organic feedstuffs may push organic concentrate prices higher. From a technical point of view, as well as in line with animal welfare principles, such limitations and the availability of allowed feedstuffs is also negative, as it may hamper animal health and welfare . Thus, feed is an area in which organic principles, organic regulations, and sustainability may be in conflict. As a consequence, strategies addressing the global need for more sustainable production must be defined and implemented. There are two principle views on this topic. The first supports the idea that fewer animals must be reared and that their nutrition must be based on local resources. This approach implies the transition of human diets towards a lower inclusion of animal protein. The second one is more focused on the technical side, and related to sustainable intensification: it assumes that animal nutrition is key for meeting organic principles (such as animal health and animal welfare) and considers the need to find solutions for global food security (the abovementioned increase in demand of animal origin). A reliance on grazing resources may have positive effects on farms’ economic and environmental sustainability. Moreover, it is in line with organic principles, as it increases the association between agriculture and livestock. From an economic point of view, case studies in Sweden have shown that feeds grown on-farm are more environmentally favorable than imported feeds, partly due to their lower energy requirements for transport  and lower greenhouse gas emissions . Due to the cost of protein, it may also be economically beneficial for farmers to include more home-grown proteins in dairy cow diets . Due to this, different authors (e.g., reference ) have considered that although the integration of crops and livestock is essential for the economic sustainability of pasture-based ruminant systems, the local context makes it necessary to analyze the financial effects of such an integration and its optimization under the specific farms’ conditions. Flaten et al. observed that the higher prices of low input grazing-based systems and the 100% organic feed rule will increase the marginal feed input cost, making it unprofitable to keep the same number of cows, which forces farms to make profound management and structural changes (less output of milk per cow, less milk produced in total, and more family labor allocated off-farm). However, organic systems that are based more on pastures suffer less . Flaten and Lien  examined the management and financial effects of feeding organic dairy herds in Norway based on the 100% organic feeding rule (compared with 85% organic feeds). They found that the high price of organic concentrates caused economic losses of 7–12% of the expected net income with 85% organic feeds in some cases, which was found to be one of the main reasons for ceasing organic certification. As a consequence, different authors found that certified organic farms that were not selling organic products [10,11,26] lacked market orientation and only sought benefits through agricultural subsidies. These studies referred to Mediterranean Europe, with pasture-based production systems but with a scarcity of feed resources at the farm level due to their geo-climatic characteristics. Moreover, as self-sufficiency and the reduction of feed cost have been identified as essential for pasture-based ruminants’ farms—organic ones included —the aforementioned decrease in milk production could have no detrimental effects for the sustainability of farms. In principle, such reductions in milk output could be seen as negative. However, in cases in which milk production is associated with a lower use of external feed, the farms’ economic sustainability may be positive if the ratio of input/output is beneficial and the farmers still obtain enough income. Moreover, the lower use of feed would be in line with organic principles. This higher self-sufficiency was also identified as positive by the cited authors , as the organic system offers opportunities for reducing N surpluses. However, soil management should be improved, as they detected the risk of P (phosphorus) and K (potassium) deficits and the need for additional fertilizer. Once more, the importance of adequate integration of livestock and crops, as well as correct grazing systems, is highlighted. However, there is a lack of association between arable farming and livestock production. This could be linked to the weak motivation of organic farmers to adopt conservational agriculture . Asai and Langer  observed such a decoupling in Denmark, as a consequence of farms’ specializations. They proposed establishing collaborative partnerships between organic farmers for manure exchange. For Heins and Chester-Jones , the most important points for reducing inputs and increasing profits in organic dairy systems were to produce high-quality forages and maximize the dry-matter intake on the pasture. Grazing also plays a role in animal health. Thus, for integrated gastrointestinal control in small ruminant farming, Mahieu et al. studied the feasibility of a “leader–follower” grazing system instead of specialized paddocks. Muñiz-Lagunes et al. analyzed the anthelmintic resistance in gastrointestinal nematodes from grazing beef cattle in the Campeche State, Mexico. Along the same lines, Marshall et al. studied the parasitic loads and growth performance of goats and kids under sequential and mixed species grazing with cattle at a constant stocking rate. From the environmental point of view, techniques based on nutrient recycling (such as conservative agriculture) should be used. In crops, the integration of legumes is positive as they help in fixing nitrogen and reduce the external dependence on protein—which is high in many areas, such as Europe. Moreover, the correct management of the integration of ruminants in the agro-ecosystem increases carbon sequestration, thus leading to reduced environmental impact [9,10,23,33]. From the perspective of the animal’s health, local herbs can also be seen as providers of chemical compounds that reduce the incidence of certain diseases—mainly those caused by internal parasites. Moreover, forages contain other compounds that help to modulate rumen microbiota and increase feed efficiency. This is the case for alfalfa ants, high in malic acid content, which help to reduce the incidence of acidosis, and increases diet digestibility and milk production. Moreover, some legumes contain useful compounds for parasite control. Rumen microbiomes are complex and interact with dietary compounds. Therefore, the use of products that in a ‘natural’ way allows to both modulate rumen microbiology and normal rumen functioning is required for the high production levels to achieve food security. The activity and concentration of compounds in herbs, as well as their low stability, high variability, and the synergetic/antagonistic effects among them, make it necessary to develop feed supplements (“feed additives”) with a precise formulation and high stability. Further studies and possibilities about the use of “natural” products as alternatives to antibiotic feed additives in ruminant production can be found in Jouany and Morgavi . These authors reviewed a wide range of feed additive types: probiotics, dicarboxylic acids, plant and plant extracts, tannins, saponins, essential oils, and enzymes. According to their study, the interactions that occur between additives, feeds, and the host are complex and more research is needed to improve our understanding of these processes. Natural plant products are a particular case among the additives reviewed. Owing to the diversity of bioactive components in these natural, non-purified preparations, their effective doses are difficult to determine and their effects on animals are not totally controlled. As Jouany and Morgavi  stated, society perceives plant extracts as “natural” and less toxic than antibiotics or other chemical products. However, this perception is unsound as there are many examples of dangerous natural toxins. Therefore, well-designed experiments that measure the exact dose-response and the risks associated with the use of these native natural preparations must be robustly tested in carefully designed clinical studies. These lines of feed supplements are of great interest to organic livestock farming. The manipulation of the host nutrition to improve host resistance and/or resilience to parasitic infections is one of the most promising options to reduce the dependence on conventional chemotherapy to control gastrointestinal nematode infections . This precise contribution of feed supplements to animal nutrition is also a key factor, as feeding unbalanced diets and/or substances in inadequate amounts increases the environmental impact of farms. Heins et al. commented on how the addition of grain supplements to the diets of grazing cattle could lead to increases in the dung quality for flies, since it likely involved complex changes in the nitrogen content and bacterial composition. They concluded that grain supplements may modestly increase the numbers of face flies and horn flies on grazing cattle herds. Of course, balanced diets are essential for animal health under all production systems. However, they are even more important under systems where the use and availability of feed ingredients and veterinary drugs are limited, such as in organic systems. To critically review and provide helpful guidance, the present work mainly focuses on dairy cattle, due to the economic importance of this sector and the high growth of organic dairy compared to organic meat production , and the reliance on feed supplements. It is noteworthy that transition dairy cows (cows in the period from three weeks before to three weeks after parturition) experience a negative energy balance (NEB) [37,38]. This arises from the increased energy demands at parturition, especially due to their genetic potential to produce high levels of milk. This, along with a decreased dry matter intake (DMI) shortly before parturition, increases the severity and prevalence of NEB, leading to different metabolic and immunity disorders, such as the risk of abomasum displacement, ketosis, reductions in reproductive performance (fertility, metritis, placental retention), mastitis, lameness, changes in milk production (yield, quality, and SCC), and even culling [39,40]. As a result, several authors have discussed the real necessity of including organic feed supplements (concentrates) in their diets. A high portion of roughage can reduce energy density, leading to a higher risk of ketosis; in addition, metabolic disorders such as hyperketonemia can be reduced by means of technical management . However, a minimum proportion of adequate/effective fiber (in terms of both composition and particle size) is needed to avoid rumen acidosis and, as a consequence, to ensure adequate carbohydrate fermentation . From the economic point of view of farms, a higher (but adequate) content of fiber may increase milk fat production, which has a direct impact on milk price at the farm level. Therefore, the balance between NEB, rumen health, milk yield, and milk quality (milk fat percentage, which is the main parameter determining milk price) must be pursued. Each farm manager must assess the profitability of each strategy in the context of the farm. Researchers have comparatively assessed the NEB of cows in organic and conventional farms , with no conclusive results when animals were fed on 75% organic feedstuff. After this study, organic European regulations changed and obliged animals to be fed 100% organically, making stakeholders and researchers concerned about the difficulty of carrying out such a feeding regime. After the regulatory change, new studies (e.g., reference ) assessed the effects of turning to a 100% organic feed on the metabolic and health statuses of organic dairy cows. Although the authors recommended that the results of their study be interpreted cautiously due to its size, most of the results were biologically reasonable and agreed with previously published results [41,43,45–48], finding no evidence that organic cows were more challenged metabolically under the new legislation or that organic cows in early lactation had any signs of severe NEB. Therefore, the authors concluded that the change in regulation and, thus, the obligation to feed livestock 100% organically should not give rise to concerns about NEB in early lactation cows in organic herds. In organic production, the increased legal restrictions in ruminant nutrition—restrictions in the use of concentrates and the necessity that the ration be 100% organic—guarantees compliance with consumer demands on naturalness and the principles of organic production . However, in cases, such as drylands and semi-arid agroecosystems, these restrictions are hampering the possibility to set up organic livestock farms, which could be useful as a tool for rural development and landscape/environment conversation . Moreover, in drylands where extensive, pasture-based production systems are common, a few conventional farms were converted into organic ones but later had to revert due to the inability to feed their animals organically . This could be viewed negatively by citizens if it happens in locations where farms receive subsidies to help their conversion to an organic system, but the farms to not bring any organic food to market. The abovementioned regulatory restrictions on the use of feed in organic farming is problematic for food security in face of the necessity (FAO) to produce more animal-origin foods. Moreover, such high production levels are required for the economic sustainability of farms (productivity and profitability) when profit margins are low in many livestock farms, and to achieve economies of scale that improve the supply chain. Such economic sustainability has a great impact on local development, the economy, and employment. Of course, as has been discussed, part of the solution would be a transition to diets with a lower inclusion of animal-origin food. The excessive negative energy balance in dairy cows during the transition period can lead to other metabolic disorders such as insulin resistance (IR) and, in turn, increased diseases, reduced milk production, and worsened reproductive performance. To assess this, Abuelo et al. [49,50] investigated the relationship between IR and oxidative status OS in dairy cows during transition. The study showed that OS affects peripheral insulin concentration and the incidences of insulin resistance. The authors expressed the necessity to carry out studies to assess the effectiveness of antioxidant therapy on insulin sensitivity in peripheral tissues during the transition period of dairy cattle. In parallel, the same authors  comparatively assessed the redox balance (oxidative status) of organically and conventionally managed dairy cattle during the transition period, finding that organic cattle had a lower concentration of reactive oxygen species—a marker of the oxidative status—and also a lower antioxidant capacity (protection against the oxidative effect of reactive oxygen species). When these two indicators were studied together, organic cattle were shown to have a higher risk of oxidative stress, which has many negative metabolic, productive, and reproductive implications. The authors concluded that, although confirmation of results is needed, these findings could be due to a lack of antioxidant supply in organic farming. It is important that the feed industry takes this into consideration, and the use of antioxidants would be even more important in organic systems than in conventional farms . Minerals as nutrients have been studied extensively in organic dairy farming, due to their influence on animal health (through immunity). Trace minerals, especially zinc, are essential to maintain the normal function of the immune system in ruminants [52,53]. Copper has been related to an increased resistance to mastitis (one of the most relevant problems in dairy farms) , particularly that caused by Escherichia coli. López-Alonso  reviewed the importance of trace mineral nutrition in organic livestock farming and found that the use of chemical forms of minerals (such as organic minerals/chelates) that are effective in production performance and health must be considered. Trace minerals are chemically bound to a chelating agent or ligand, usually a mixture of amino acids or small peptides. This makes them more bioavailable and bioactive and provides the animal with a metabolic advantage that often results in an improved performance. On the other hand, pollution caused by minerals is a severe environmental issue. In fact, authorities have been continuously reducing the maximum supplementation levels allowed in animal feed. They can, therefore, be included at much lower levels without compromising performance, thus minimizing nutrient excretion and lowering pollution and the environmental impact of farms . For all these reasons, there is a growing interest in organic farming for organic (proteinated or chelated) trace minerals. Furthermore, improvements in the efficiency of feed production and quality, such as corn silage for dairy cows, is highly important. Different silage inoculants (microbial cultures) are useful, but not permitted. The control of mycotoxins has become a hot topic in animal health and even food safety, and mycotoxin binders have proven to be effective. Silage is an important component of dairy cow diets worldwide. Forages can be contaminated with several mycotoxins in the field pre-harvest, during storage, or after ensiling during feed-out. Exposure to dietary mycotoxins adversely affects the performance and health of livestock and constitutes an important risk for human health. 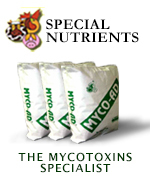 Problems associated with mycotoxins in silage can be minimized by preventing fungal growth before and after ensiling. Proper silage management is essential and must be the first step in preventing/reducing the mycotoxin contamination of dairy cow feeds [55,57]. However, warm and humid weather conditions make it very difficult to control contamination without the use of mold-inhibiting feed additives such as mycotoxin binders used either in the silage or in the Total Mixed Ration (TMR). Animal health and welfare, feed efficiency, and even human health are impacted. However, organic regulations do not allow for them to be used. Another interesting aspect related to feed and the use of local resources is the use of agricultural by-products. This topic matches the organic farming principle of ecology: It can reduce the carbon footprint and promote a circular economy and the local economy. The present work recommends that regulators consider allowing local by-products, even if they are not certified as organic, as long as it can be demonstrated that inorganic fertilizers and pesticides have not been used. This would reduce food wastage and would add more sense to the organic model of production. Other novel feed materials that are popular with researchers are seaweeds and insects. The diversity of seaweed is important—before choosing the right species and maturity stage it is necessary to determine its nutritional composition. Nonetheless, they are worthy of attention due to both their abundant availability and the presence of interesting components. According to Makkar et al. , seaweed concentrates minerals from seawater and contains 10–20 times the minerals of land plants. Additionally, they also contain polyunsaturated n-3 and n-6 fatty acids, which are very important for animal and human health. However, from the environmental point of view, the sustainability of their life cycle must be considered, particularly the stages from extraction to delivery to farms. Insects could be a part of the solution to coping with the 60–70% increase in the consumption of animal products expected by 2050, due to ongoing climatic changes and the food–feed–fuel competition. Moreover, the costs of conventional sources of proteins used as feed (such as soymeal and fishmeal) are very high, and their availability could be limited in the future [59,60]. Sánchez-Muros et al. reviewed the properties of insect meals in animal feed as a source of renewable and sustainable protein. They concluded that insects have a great quantity and quality of proteins, which can contribute to animal health. Related to the NEB and DMI issue in dairy cows, regulatory limitations in the use of feedstuffs could be playing a negative role. Escribano  found that organic beef cattle farmers in Southwest Spain reported that their fattening calves consumed less feed than those under the conventional system. Such farmers considered the cause of this as the lower palatability and quality of the organic concentrates. The lower allowance in the use of technological feed additives by regulation, shorter feed industry experience, and scarce competitiveness within the organic feed industry could be the reasons. It is worthy to mention that organic livestock farms are, in many cases, located in drylands following pasture-based (high-forage) production systems, and suffer from seasonal fluctuations in forage supply [14,62]. This can often limit production during high nutrient-demand phases, such as lactation and growth, leading to nutritional deficiencies . In this case, feed supplements are necessary. In fact, supplementation is a common strategy to counter a seasonally uneven nutrient supply. However, this may not be economically viable for organic goat production  and beef cattle farms under the semi-arid conditions in southwest Europe [10,63] due to the high cost and availability of organic concentrate. High forage systems adopted by organic goat producers also present a challenge for an integrated nutrient supply and reproductive synchronization (which is essential for the ruminants’ production and health), leading to a relatively stable production level over time . Taking into account the fact that animals reared under extensive conditions expend more energy and tend to produce less, such as the organic pigs studied by Prunier et al. , the use of feed additives that “naturally” improve feed efficiency would often help. This could also be applied to more intensified organic farms such as many organic dairy farms. The EU is highly dependent on the import of protein-rich animal feed , and the availability of organic sources of protein constitutes one of the major constraints on livestock production. Taking into account the effect of animal nutrition on performance, immunity, and health, the development of programs that increase the availability of organic sources of protein must be considered. Research has shown that improved dietary protein supply improves the resistance and/or resilience to diseases in grazing dairy ruminants. For instance, Wang et al. determined the effects of varied protein intakes on the immune responses in goats infected with Haemonchus contortus. The dietary Crude Protein (CP) was 6.6%, 9.5% and 12.4%, respectively. The authors found that the protein supplementation in goats transiently inhibits the worm’s fecundity through enhanced IgG expression. The worm eggs appeared in the feces from the goats fed diets with 0 or 5% Fish Meal (FM) in week 3, but were not detectable in goats fed the 10% FM diet until week 4 post-infection. The infection of H. contortus increased (p < 0.01) in the blood eosinophil and the tissue mast cells. The numbers of mast cells in the spleen and mesenteric lymph nodes from the infected goats were lower (p < 0.05) in animals fed the 10% FM diet. Therefore, the availability and correct formulation of proteins allows for the reduction of the reliance on veterinary drugs and, thus, the environmental pollution, ecosystem quality, and resistance (in both animals and humans) to such medicines. Due to the high prices of organic feed and their low availability, companies struggle to find organic feedstuffs . Escribano et al. [14,17] found that one of the most important organic feed companies in Spain usually faced great difficulties in finding organic feedstuff to produce its concentrates, even though its level of production was not very high because the company mainly used the feed material for their own farms’ consumption. Thus, the other organic livestock farms studied by the authors found great difficulties in buying organic feed, with availability and price as the main factors. This situation had two main consequences. First, the farmers did not produce any organic animal goods (calves/meat), which lead to the regional government considering not renewing their organic certification. Second, the farmers frequently requested the regional certification body to allow them to introduce conventional feedstuff (mainly straw) due to the lack in the market and the absence of pastures in the farms between the end of May and October. The main strategy to deal with high prices has been to omit concentrate from dairy nutrition, despite the fact that they are needed and will become more important in the future. This has been seen as a potential opportunity for substantial cost savings in organic dairy production . However, before making any decisions, the effects of the use (and absence) of organic supplements must be assessed, not only from a physiological point of view, but also taking into account possible market scenarios. Different market conditions, such as the specific Norwegian price subsidy on off-farm processing of grain highlighted by Flaten and Lien , influence economic performance in different farming contexts. Heins et al. found that the profit per day (income over feed cost, $/cow/day) was higher for cows consuming 100% pastures and those consuming low grain diets compared to the cows with a higher intake of grain ($1.76 versus $0.85 versus $0.61, respectively). Flaten and Lien  complemented the study by Blanco-Penedo et al. by studying the changes in resource use and the financial impacts of organic dairy herds in Norway under the 100% organic feeding rule, in comparison to the previous 85% one. They found that in all cases, the introduction of the 100% organic feeding rule resulted in economic losses (7–12% of the expected net income with 85% organic feeds) due to the higher price of the organic concentrates. Mogensen et al. found that Danish organic milk production, based entirely on organic feeds, reduced their financial costs after supplementation with rapeseed cakes. Ertl et al. showed that a zero concentrate supplementation strategy had no negative effects on profitability, although the milk yield was lower. Despite the lower milk performance in the C0 group (no concentrates), the marginal income per cow did not differ between the groups (WG1: meaning up to 975 kg; WG2: 976–1400 kg; WG3: >1400 kg). This conflicting observation can be explained by the considerable savings on feed costs in the C0 farms. Compared to theWG3 farms, the C0 farms spent 8.5 Euros per kg of milk less on concentrates and only 1.19 Euros more for forage, resulting in a saving on feed of 7.31 Euros per kg of milk. The savings on feed costs resulted in a higher income per kilogram of milk in the C0 farms, which compensated for the lower milk yield in those farms. The significantly lower milk yield can even be seen from a positive perspective: Cows on farms without concentrate supplementation adapted their performance to the lower nutrient supply, resulting in lower metabolic stress with a tendency for improved fertility and animal health. Heins et al. observed that cows consuming 100% pasture (no grain supplementation) compared to low grain (2.72 kg/head/day) and high grain supplementation (5.44 kg/head/day) have been shown to produce less milk (see Table 1). However, their milk had a fatty acid composition with potential benefits to human health. This potential benefit to human health should be considered as a marketing strategy for farmers, as the healthier milk can be sold at a higher price. The potential extra income for farmers would balance the lower production level when compared to the 100% pasture production systems. Table 1. Milk production responses of cows reared under three levels of grains supplementation (Heins et al. ). Blanco-Penedo et al. found that the coefficient of the fat–protein ratio was twice as high in conventional systems compared to organic farms (2.59 versus 1.61), confirming that the increase in the fat–protein ratio was significantly associated with higher odds of clinical ketosis. This not only has health-related consequences, but also economic ones, from the perspective of costs and income (higher milk fat percentage is related to higher milk price). Compliance with organic and agro-ecological principles should not lead to reductions in health and welfare status. Paraphrasing Hippocrates’ famous quote, at this point, it makes sense to state “let the feed be the medicine and medicine be the feed”. One of the most interesting strategies in organic livestock production is making use of beneficial chemical compounds contained in herbs, as this reduces the reliance on external veterinary drugs, which are limited to 2–3 treatments per adult cow. It also reduces production costs (increasing self-reliance, which is one of the pillars of organic farming). Lu  concluded that protein intake, legumes, and secondary plant compounds are clear alternatives to chemotherapy, which is no longer permitted in organic goat production. Chinese herbs that have been applied to growth promotion, milk yield improvement, immune function accentuation, and for disease prevention, control, and treatment merit further verification. They are promising alternatives in organic goat production . Taking into account confounding effects and interactions with other plant nutrients, the challenge is to quantitatively determine the level of toxicity of the secondary plant compounds and their anthelmintic utilization. Obviously, management and good animal nutrition must be based on a good formulation more than on the reliance on feed additives, in order to avoid conventionalization of organic production and its environmental impacts due to manufacturing and transportation. However, the use of feed additives to increase the efficiency and sustainability of farms from an economic, social, and environmental point of view would be useful in many cases. This means that organic regulations must be checked with an integrative approach, that is, with the participation of all stakeholders involved: farmers, technicians, the feed industry, certification bodies, and policymakers. Additionally, a higher presence in the market of nutritional solutions containing beneficial active components for animal health is needed. Since nutritional strategies must be site-specific, a participatory approach focused on gathering and exchanging local knowledge must be carried. This will bring useful, practical ideas such as those published by Fonseca de Almeida et al. after studying the attitudes and perceptions of three groups of family farms on alternative feeding strategies for raising broilers. For this, the use of feed additives is essential. In the face of a lack of knowledge and practical experience, Lu  recommended strategies for the nutritional management of dairy goats. Similarly, Mogensen et al. formulated six production strategies aimed at increasing the understanding the possible effects that the 100% organic feed rule would have on systems of whole organic dairy cows. The strategies differed with respect to the type of concentrated feed, the level of fresh grass-clover in the ration, and the length of the calving interval. They found that supplementation with cereals, rapeseeds/cereals, or grass pellets, as well as increased grazing, gave very similar productivities and financial results, but supplementation with rapeseed cakes reduced crop production and, in turn, financial returns. Shortening the calving interval is key for the productivity of farms. Additionally, they found that only a prolonged calving interval had a positive effect on the productivity and the financial result of the organic dairy farm, which was related to the milk yield persistency and feed intake per cow. Due to the lower inputs, a self-sufficient system offers opportunities for reducing N (nitrogen) surpluses, and raises the risk of P (phosphorus) and K (potassium) deficiencies and the need for additional fertilizer input. In relation to livestock management, the calving and milking period must be programmed to matches the season in which the availability and price of organic feed resources are beneficial. The strategy could be to program the calving interval with the period in which the grazing resources are abundant. Under north European conditions, such as Norway, spring calving is the most concentrate-saving choice . In Mediterranean regions, forages are more abundant in autumn, followed by spring, winter, and summer. Due to this, calving just before or during summer should be avoided and favored in spring and autumn. Furthermore, soil, crop, and pasture management is essential in improving their quality and productivity through efficient nutrient recycling. Moreover, silage quality is also of great importance for dairy farms, as this constitutes almost half of the ration. Flaten et al. recommended to do the first plant cutting approximately one week after heading. With regard to arable farming, harvesting at earlier stages of maturity could, however, adversely affect forage yields, the survival of the swards in the harsh Norwegian winter, and silage production costs . Moreover, higher forage quality would have positive advantages for the environment, as it reduces gross methane emissions per unit of product (milk and/or meat) . In terms of market availability and to avoid market failure, organic crops and permanent grasslands in Europe should be promoted, and maybe even financially supported, by the Common Agricultural Policy (CAP). Nutritional grouping may also be beneficial. Cabrera and Kalantari  created different groups of lactating cows on the basis of their nutritional management. The authors concluded that using multiple, more-homogeneous TMR feeding groups is economically beneficial because there is a nutrient cost saving, an improvement in productivity, or both. Nonetheless, no consensus was formed around this technique, nor has it been widely adopted. Cabrera and Kalantari  reported a consistently greater income over feed cost ($/cow per year) with multiple TMR groups compared with 1 TMR (3 TMR = $46 and 2 TMR = $21–$39). According to these authors, the critical factors that determine the economic value of nutritional grouping are: (1) the criteria for grouping; (2) the nutrient specifications of the diets; (3) the effects on milk production; (4) the health and environmental benefits; (5) the number, size, and frequency of the grouping; and (6) the additional costs and benefits. It has been documented that grouping cows with similar nutritional requirements is a good strategy. This can be carried out by grouping according to days in milk, milk production, production level, and body weight combined. However, dairy farms do not usually split lactating cows into different groups. The economic efficiency of dairy farms can be improved substantially by adopting optimal nutritional grouping strategies for lactating cows. These strategies promote more precise feeding with increased productivity and lower feed costs. Moreover, precise feeding reduces nutrient excretion and emissions (pollution) to the environment. Both improved herd health and decreased environmental effects have positive economic implications that should also be considered. A precise formulation is essential to reach the genetic potential of the animals and to avoid health issues, as well as to avoid losses of profitability and increased pollution. However, both animal grouping and precise formulation require additional labor and technical knowledge. Leveraging diet selection and eating behavior can also be beneficial for maintaining a diverse plant landscape and more sustainable land use . Escribano and Ryschawy  analyzed its potential through case studies of livestock farming under organic agroforestry systems by proposing different grazing strategies. Agroforestry, the integration of trees, crops, and/or livestock on the same area of land has been identified by the International Assessment of Agricultural Knowledge, Science, and Technology for Development (IAASTD) as a “win–win” multifunctional land-use approach that balances the production of commodities (food, feed, fuel, fiber, and so on) with non-commodity outputs such as environmental protection and cultural and landscape amenities . In fact, it has been recognized by the EU Council Regulation 2011/0282  as a relevant measure for “restoring, preserving and enhancing ecosystems dependent on agriculture and forestry” (page 7) and “promoting resource efficiency and supporting the shift towards a low carbon and climate resilient economy in the agriculture, food, and forestry sectors” (page 8). Good animal health and the longevity of cows are interrelated. These two aspects are key to the profitability and sustainability of farms. Reductions in robustness are especially negative for organic farms, as the control of diseases is more difficult to manage due to the restrictions on the use of veterinary drugs. From an economic point of view, it is interesting to mention that Horn et al. proved that extended longevity allowed for the maintenance of the profitability of farms, despite the lower average milk yield found per cow per day. As discussed above, such maintenance of the profitability despite a lower productivity probably came from the reduced use of concentrates and reduced exposure to market fluctuations, feedstuff costs included. Nowadays, production levels under intensive production systems require animals to be sometimes managed with a thinner line between health and the risk of becoming ill. Higher production levels also bring lower productivity lives, which are related to reduced fertility, and increase the cost of breeding. Cows’ average productive life is decreasing around the world, with averages of 2 lactations in Denmark , or 2.8–3.6 months , which means between 2 and 2.5 lactations. On the other side, organic farms tend to rear more robust animals or, at least, tend to have more milk production cycles (longer average productive lifetime). Further, Horn et al. found that the profitability of organic dairy farming is influenced mainly by lactation performance and longevity. Therefore, the relative importance of herd lifespan, health, and reproductive traits should be strengthened. According to the authors, reductions of milk yield do not necessarily lead to lower profits if they are accompanied with an increase in longevity. Moderate milk production levels allow for lower amounts of concentrates and sustain the on-farm production of feedstuffs, especially in pure grassland areas. This supports the fulfillment of the organic farming principles of sustainability, minimizing off-farm inputs, and closing nutrient cycles, and may lead to higher consumer acceptance. With regard to the external analysis of farms, the authors stated that given that the future may bring less market regulation, decreased economic compensation for farmers, lower milk prices, and a potential increase in the production costs; strategies to minimize inputs and costs appear to be economically and ecologically superior. Animal production is a key sector as it must meet consumers’ demands and the need for higher sustainability while meeting future predictions of increased global protein consumption by humans. Different production systems have been proposed as potential solutions, among them organic farming. However, the availability of organic feed in the market and the restriction of many useful feed supplements not certified as organic but in line with different organic farming principles (such as animal health and animal welfare) make it difficult for organic farms to improve. Thus, help is needed to increase food production. On the other hand, such regulatory limitations hamper the conversion of conventional farms and feed companies to organic systems. Moreover, the feed industry needs solutions, as it is facing challenges, such as the reductions in the use of antibiotics, the efficiency in the use of feed, and improvement of farms’ sustainability. In the case of organic farming, the final objective is not only to certify organic farms/companies, but also to be a solution for global sustainability. Thus, it is necessary to re-think the approach of organic regulations and certifications so that the focus can be on global needs with an integrative approach that takes into account all the stakeholders involved: policymakers, farmers, technicians, researchers, and so on. This will be the way for the livestock sector and the feed industry to work towards sustainability [2,77]. Here, different strategies to overcome these issues have been proposed, taking a critical approach and focusing on the benefits and the need of having a higher availability of organic feed additives, as well as a higher allowance of some additives that are not certified as organic, but would be benefit animals, farmers, and societies because they help to carry out more precise formulations and/or cover animals’ nutritional needs with no risk to humans or to the environment. For instance, by using supplements that reduce environmental pollution (in line with the organic farming’s principle of ecology) and aid animal welfare and health (principles of health, fairness, and care). In this sense, an appendix of allowed “non-organic but sustainable” feed supplements could be included in organic regulations. Their condition of being sustainable should be of course defined, which could be done, for example, on the basis of their carbon footprint, localism, and other similar characteristics with relationship between organic farming, sustainability needs (food security included). Moreover, the benefits of using local resources and providing different strategies related to the technical management of animals that are of interest for organic farms in relation to animal nutrition such as grouping, grazing strategies, and the beneficial intake of plant components for the heath of animals have been also discussed. Overall, aspects such as physiology, nutrition, eating behavior, diet selection, seasonal nutrient supply, and environmental interactions must be studied and implemented more accurately than in conventional systems where there is a higher availability of feed resources (feed materials and feed additives) and veterinary drugs, as well as a higher flexibility in terms of their use. Thus, organic livestock farming requires a higher level of knowledge and a willingness to participate in a process of learning and transition towards a more complex and integrative management of systems that needs all stakeholders to be involved and regulations to be revised. Special thanks for Sustainability journal editors for their invitation to contribute with the present work. This article was originally published in Sustainability 2018, 10, 2393; doi:10.3390/su10072393. This is an Open Access article distributed under the terms and conditions of the Creative Commons Attribution (CC BY) license (http://creativecommons.org/licenses/by/4.0/).